The understanding the state of conservation of marine ecosystems and the distribution and recovery capacity of marine species continue to gain momentum among marine scientists, marine resource users and other stakeholders. The main concern is overfishing, which affects the supply of seafood, income generation for large, medium and small-scale fisheries and the livelihoods of resource-dependent coastal communities, especially those in the developing world. Of the approximately 250,000 catalogued marine species, about 16,000 species are exploited by commercial fisheries. Projections made by marine scientists estimate between 2 to possibly 10 million fish species yet to be discovered and probably exploited. Predictive models coupled with bibliometric analyses showed that in the first decade of 2000 the number of authors describing new species each year increased to up to 4,900 authors. In Brazil, which covers almost half of South America and holds more than 20% of the total number of species on Earth, the species richness and range of known distribution grows each year. Surprisingly, in Brazil and elsewhere, new species are still being discovered and described even among large-bodied or economically important groups. Clearly, the rate of discovery is greater for taxonomic groups poorly studied in the past. The number of marine species not described is partly due to the number of habitats and geographical areas that remain unexplored. One side effect is the current knowledge gap on the distribution of species along its expected range. This was the case of two coastal species in Brazil, recently registered in the coastal fishing of Rio Grande do Norte, on the northeastern coast of Brazil: the pacuma toadfish (Batrachoides surinamensis) and the spotted ocean triggerfish (Canthidermis maculata). Pacuma toadfish are commonly found in shallow brackish waters of estuarine environments and were recorded in the northern portion of the state, while spotted ocean triggerfish are an offshore fish that have a tropical circumglobal distribution; its presence was recorded in the central portion of the state. 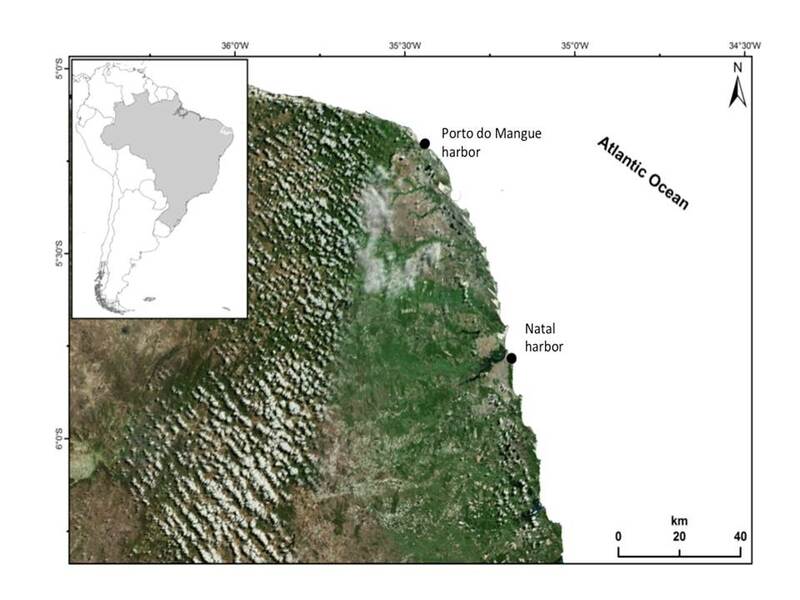 The state of Rio Grande do Norte was, until then, the only gap in the expected distribution range for pacuma fish. On the other hand, it was expected that the spotted ocean triggerfish would occur along the entire Brazilian coast, although it was previously recorded only in two places: one in the northeast (Bahia state) and one in the south (Santa Catarina). Both species are listed as being of Least Concern by the International Union for Conservation of Nature - IUCN (Collette, 2010, Laws, 2015) and by the Brazilian Red List of Threatened Species (Decree 445, Brazilian Red List, 2014), and there is no record of their exploration in Rio Grande do Norte. 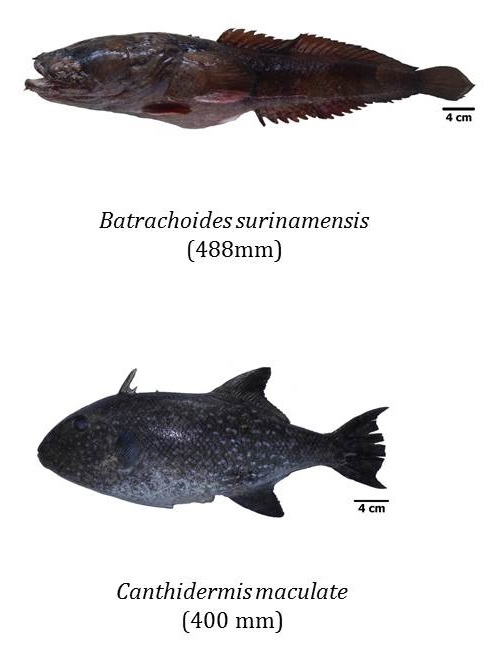 In general, most of the research concerns commercially important fish, explaining why fish, such as these two recently described, were not noticed. In addition to misreporting or total absence of reporting, there is also the risk of wrong labeling, since many species are often landed as fillets, making it difficult to identify and protect them properly. Finally, there has been a growing global demand for triggerfish for human consumption, for export and for aquarium purposes, making fishing pressure even heavier on this species. 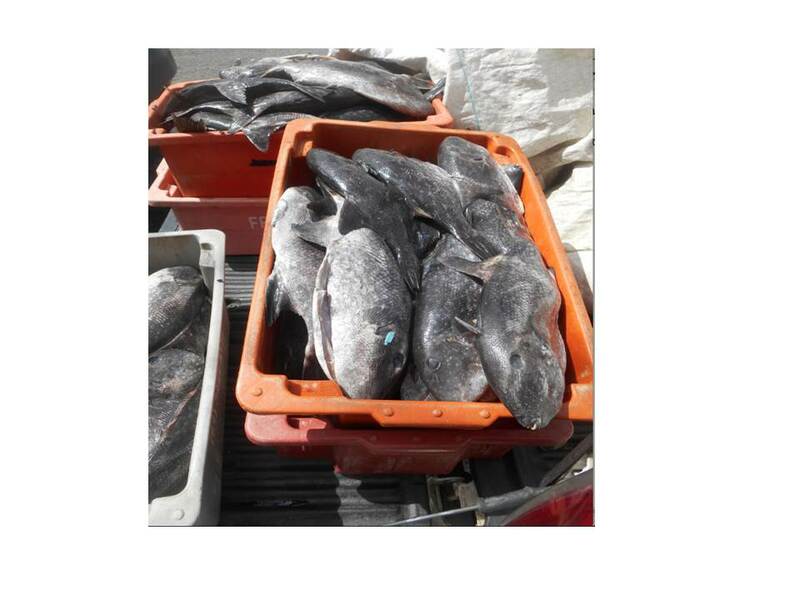 We confirmed this trend, since after our first registration of the spotted ocean triggerfish, we registered the total landing of 1.6 tons of the species in five months of landing records in the main port of Natal (in the state of Rio Grande do Norte). On average, it represents 230kg of species landed monthly and more than 1,500 individuals captured per month only in the main port of Rio Grande do Norte. In terms of research, this is just the tip of the iceberg, , a lot more ought to be done before we can truly understand these species and attribute a precise conservation status to C. maculata and B. surinamensis. If, on the one hand, commercial fishing can take these species out of the shadows, on the other hand, it can also lead them to exhaustion, especially if fishing has only started focusing on them because of a shortage of previously preferred targets. Therefore, while such records may boost interest in the economic importance of spotted ocean triggerfish in the Western Atlantic, as suggested by the recorded catch rate, we may not have time or human and economic resources to assess the ecological status of these resources before they are overexploited. Pacuma toadfish (Batrachoides surinamensis) was recorded in Porto do Mangue. Spotted ocean triggerfish (Canthidermis maculata) was recorded in Natal harbor. Roughly 100 individuals of Canthidermis maculata landed on 2nd March 2017 in the main port of Natal (Rio Grande do Norte state). Total landings recorded on this date reached 600 kg of the species. MMA (2018) Biodiversidade. http://www.mma.gov.br/biodiversidade. Accessed 17 Jan 2018. Steege H, Vaessen RW, Cárden D, et al. 2016. The discovery of the Amazonian tree flora with an updated checklist of all known tree taxa. 1–15.